How do you know you're choosing the right platform? The best funds disbursement platforms help displace expensive payment methods and make sending out funds faster and easier. But not every platform does. To ensure you're getting the right platform for your organization, you need to look for specific features and support options. 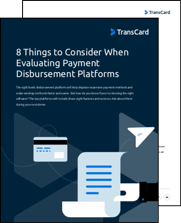 Download "8 Things to Consider When Evaluating Payment Disbursement Platforms" to get the details.